The F4 ABS continues to play an important part of the history of high performance motorcycling. It is the epitome of emotion, performance, and speed clothed in a uniquely desirable design. 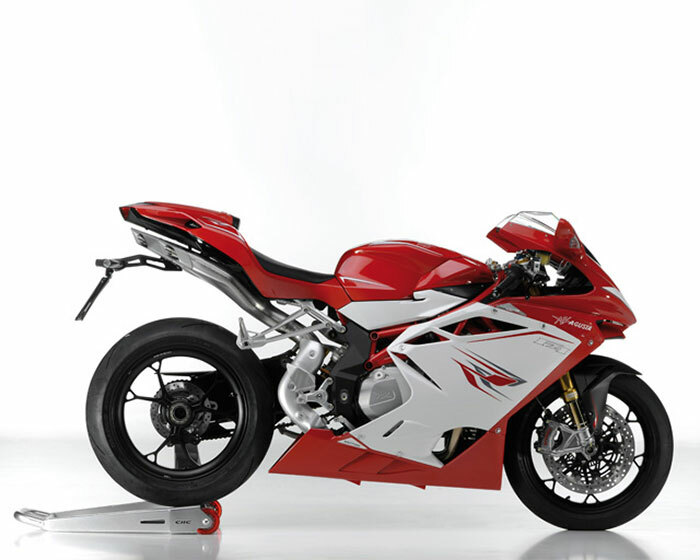 THE NEW MV AGUSTA F4 ABS. Crossing the border of imagination. The new F4 ABS is our best yet, encompassing the latest technology and engine developments…A true state of the art masterpiece. 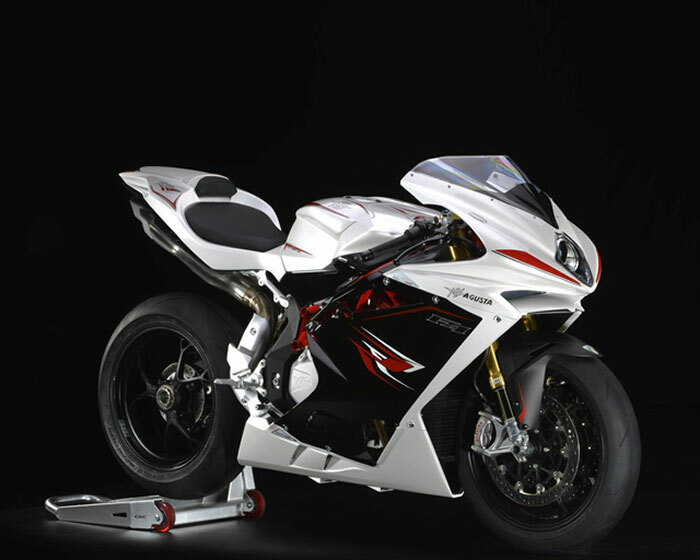 After intense months of design, development and testing MV Agusta has redefined the characteristics of the F4 ABS with an ambitious underlying goal to make the F4 ABS the most advanced hypersport bike on the market. We achieved this by creating two versions to form the new range for Canada, sharing the same distinctive DNA yet possessing different technical solutions to satisfy every rider. The F4 RR ABS contains the most advanced engineering solutions, enhanced by a range of technical excellence to offer the complete control of the vehicle and maximum performance: chassis control utilizing vehicle inertia sensors, a unique engine control with Ride-By-Wire system, Ã–hlins electronic control suspension and steering damper as well as GP spec titanium connecting rods. The unique and comprehensive technology of the F4 RR ABS has been extended to the version F4 ABS , which also shares several aesthetic and functional innovations. These include a re-proportioned and lighter “signature” four exit silencer, new lightweight wheels and a new front spoiler integrated into the front fairing with DRL (Daylight Running Lights) that enhance the design, as well as the new tail light incorporating light guide technology. All complemented with completely new graphics and colors. These elements make the new F4 ABS more advanced than ever before, yet with total respect for the history of this iconic machine. Our objective was to create a vehicle that exceeded the expectations of customers based on a new technological platform, focused on electronics and its fundamental contribution improving power delivery of the engine and driving dynamics on the road and on the track. All this combined with a thorough review of the engine to provide competitive performance. The identity of F4 ABS has been accentuated further with the integration of new design solutions and distinctive features present on the new model. A motorcycle that has already won countless awards in virtue of its beauty. The attention to the sensual form of the bodywork has inspired the designers choice of graphics and color. The front headlight is flanked by two distinctive light guides positioned on the leading edge of the spoiler: in this way an aerodynamic element becomes a distinctive element of the front view day or night, as well as helping to improve active safety by improved frontal visibility. Similarly the new rear light gains intensity through an integrated light guide. Completely new wheel designs employing considerable weight reduction are now available in two versions: the first, F4 ABS, utilizing razor thin spokes and a silver finish, the second of F4 RR ABS, further reduces the weight and material thickness through the process of forging aluminum alloy, besides the implementation of a race inspired design. There has been a significant update to the four tailpipe exhaust system, a characteristic feature of the F4 ABS from its incarnation. The two external terminals are now much shorter and tapered, the central pair extends up above the end of the tailpiece. The F4 ABS is even more racing, and lightweight both visually and physically! A four-cylinder advanced “short stroke” engine powers the entire F4 ABS range. Piston diameters of 79 mm are combined with a stroke of 50.9 mm. The peak rev limit has been raised to 14,000 RPM for the F4 RR ABS. 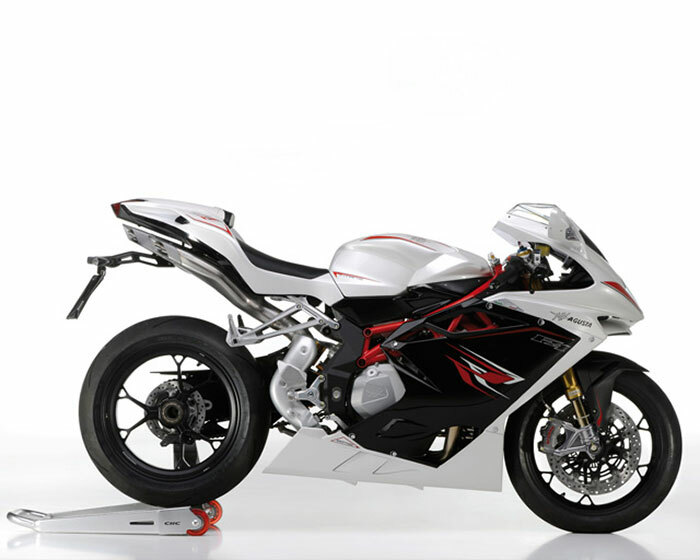 The assembly is completely by expert technicians and thus very precise, with the selection and measurement of all components to ensure perfect uniformity and maximum performance; A procedure that only MV Agusta could adopt. The engine has undergone a thorough update of the distribution system: the intake and exhaust valves now use a single spring instead of the two of the previous model. In this way the moving mass is reduced to the advantage of the speed reached by the motor and the speed and reactivity to engine rpm. The piston blanks are hard anodized treated to be even more durable and reliable. The connecting rods of the F4 RR ABS are made of titanium, a solution more akin to a GP racer not a production machine, to offer improved strength and lightweight, matched to a rebalanced crankshaft. The oil circuit has been redesigned, inside and outside the engine crankcase with the aim of ensuring perfect main bearings and connecting rod lubrication increasing reliability, even under extreme working loads. The operating temperature of the engine is now lower, due to the greater radiator efficiency and new oil lines. The short-stroke inline four-cylinder is available in two power configurations: F4 ABS reaches 195 hp, while F4 RR ABS is pushed to a record 200.8 hp. 50 mm diameter throttle bodies are employed with a revised variable length intake tract (TSS). The gearbox as on all the MV Agusta four-cylinder engines, is a six-speed unit, with the clutch featuring a mechanical slipper device. Four engine maps are available: three default and to customizable by the pilot. The system MVICS (Motor & Vehicle Integrated Control System) is now integrated onto the new F4 ABS ensuring accurate multimap engine management and driver assistance devices: traction control, anti-wheeling and shifter EAS (Electronically Assisted Shift). The central element is the Ride-ByWire system: presented for the first time on the three-cylinder F3 675, it has been fully optimized and specifically redeveloped for the new F4 ABS. The system has electronic redundancies to ensure maximum effectiveness and the safety required: the data that arrives from the two potentiometers is cross-examined with analog signals, and a third sensor confirms the requirement of complete throttle closure. Two additional sensors are arranged on the throttle bodies. Completely new and developed specifically for F4 ABS is the inertia platform sensor arrangement: it uses three gyroscopes and three accelerometers and provides the electronic control unit an array of information about the of the vehicle dynamics, moment by moment. Consequently, the intervention of traction control and anti-wheeling are particularly accurate thanks to the encoder placed on the front wheel. This system permits improved safety characteristics as well as performance. Riding is therefore simplified for the pilot; a primary objective of the F4 ABS project. The algorithms that define the function of the system MVICS, are in fact maximized continuously to provide the maximum available torque at the rear wheel, relative to the conditions of the asphalt and pilot request. The electronic assisted gear shift, standard on both versions, reduces the amount of time required to change gears. Another innovation is the system which allows you to choose your own settings in respect to the pre selected defaults, Normal, Sport and Rain. This enables you to customize five parameters (sensitivity of throttle, torque, speed limiter, engine response and engine braking), so you can construct a map of engine management that encompasses your personal riding style. The structure and geometry characteristics of the new F4 ABS are unchanged. 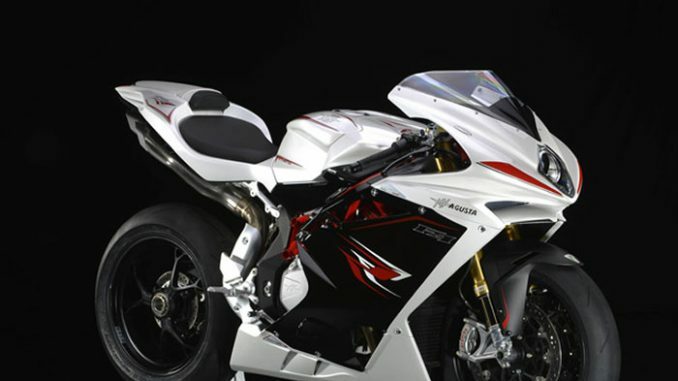 The frame is comprised of two distinctive elements, developed by MV Agusta to offer the advantages of both solutions usually proposed individually. The main section of the frame, in fact, is made of CrMo steel tubes united to a pair of cast aluminum alloy plates which form a complete structure and the fulcrum point for the sculpted single-sided swingarm. The new frame has been further optimized to reduce weight without sacrificing rigidity. The F4 RR ABS also is hand welded with TIG technology and uses a dedicated steel, with exceptional mechanical properties. Both versions of the new model offer distinct combinations of fork and shock while all providing the established traditional handling strengths of F4 ABS. The F4 ABS equipment includes a 50mm diameter Marzocchi fork and Sachs shock that are both fully adjustable. Technological excellence and complete personalization are distilled on the F4 RR ABS: Ã–hlins suspension with electronic control allows the driver to choose between different setups directly from the dashboard. As aforementioned there are specific modes of power delivery for the four cylinder engine; the pilot, however, may also adjust the suspension in a completely autonomous way from the engine maps. The system provides separate control for compression damping and rebound damping, while customizing the spring preload is manual. The electronic steering damper allows choosing between manual or automatic adjustment, in which case the response varies as a result of vehicle speed. The brake system on the F4 RR ABS is state of the art in the hypersports category. It is composed of two 320 mm diameter front discs with steel flanges. They gripped by the new Brembo Monobloc M50; an absolute reference for performance, weight and stiffness with a specifically designed and dedicated radial pump. The system is completed by a four piston rear caliper together with a 210 mm diameter disc. The F4 ABS replaces the monobloc found on the F4 RR ABS with the effective race bred Brembo M4 front brake calipers and Nissin master cylinders.